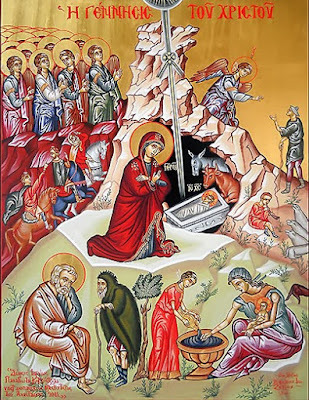 This is the festival of the virgin birth! Our address must be exulted therefore in accordance with the greatness of the feast, and enter into the mystery, as far as this is accessible and permissible, and time allows, that something of its inner power might be revealed even to us. Please strive, brethren, to lift up your minds as well, that they may better perceive the light of divine knowledge, as though brightly illumined by a holy star. For today I see equality of honor between heaven and earth, and a way up for all those below to things above, matching the condescension of those on high. However great the heaven of heavens may be, or the upper waters which form a roof over the celestial regions, or any heavenly place, state or order, they are no more marvelous or honorable than the cave, the manger, the water sprinkled on the infant and His swaddling clothes. For nothing done by God from the beginning of time was more beneficial to all or more divine than Christ's nativity, which we celebrate today. The pre-eternal and uncircumscribed and Almighty Word is now born according to the flesh, without home, without shelter, without dwelling, and placed as a babe in the manger, seen by men's eyes, touched by their hands, and wrapped in layers of swaddling bands. He is not a spiritual creature coming into being after previously not existing; nor flesh which is brought to birth but will soon perish; nor flesh and mind united to form a rational creature, but God and flesh mingled unconfusedly by the divine Mind to form the existence of one theandric hypostasis, who entered the Virgin's womb for a time. By the good pleasure of the Father and the co-operation of the Spirit, the Logos/Word Who transcends being came into being in this womb and by means of it, and now He is delivered from it and born as an infant, not loosing but preserving the signs of virginity. He is born without suffering, as He was conceived without passion, for as His mother was shown to be above the pleasure of passion when she conceived, so she is above grievous pains when she gives birth. "Before the pain of travail came upon her, she escaped it", as Isaiah says (cf. Isaiah 66:7), and she brought forth in the flesh the pre-eternal Word. Not only is His Divinity inscrutable, but the manner in which He was united with flesh is past understanding. His condescension unsurpassable, and the human nature He assumed divinely, ineffably sublime, and so far above all thought and speech, that it does not admit of any comparison with creation. Even though you see in the flesh the child born to the Maid who knew no husband, He is still beyond compare. It says, "He is fair in beauty beside the sons of men" (cf. Psalm 45:2). It does not say "fairer" but simply "fair", so as not to compare incomparable things: the nature of God Himself to than of mere men. "God, thy God", it says, "hath anointed thee with the oil of gladness above thy fellows" (Psalm 45:7). The same one is both perfectly God and perfectly man; the same God is both the one who anoints and is anointed. For it says, "God, thy God hath anointed thee". It is as man that the Logos/Word from God the Father is anointed, and He is anointed with the co-eternal Spirit who is of one nature with Him. This is oil of gladness, which is why, again, it is the same God Who is both the divine unction and the one anointed. But although He is anointed as man, as God He has the source of anointing within Himself. That is why he who beheld things in a divine manner saw and foretold that all those anointed by God were partakers of His life. For it is the property of God alone not to partake of the lives of others but to be partaken of, and to have as partakers those who rejoice in the Spirit. Such is the infant born now in the lowly stable, and hymned by us as a babe in the manger. For He Who produced all earthly and heavenly things out of non-being, when He saw that His rational creatures were brought to nothing because of their desire for something greater (cf. Genesis3:5) bestowed upon them Himself, than nothing is greater, and to whom nothing is equal or comes near to being equal, and offered Himself to be partaken of by those who so wished, in order that from that time forward we might exercise our desire for something better without risk, although in the beginning we fell into the ultimate danger on that account (cf. 1 Corinthians 15:26), and in order that each of us, in desiring to become God, might not only be blameless, but also attain to our longing. In a mysterious way, He abolished the pretext for the original fall, which was the superiority and inferiority observable in beings and the resulting envy and treachery, as also the disputes, both open and concealed, which this caused. Because the author of evil did not want to be lower than any of the Angels, but to be equal in excellence to the Creator Himself, he was the first to suffer the terrible fall before anyone else. Smitten by envy, he deceitfully attacked Adam and dragged him down to the abyss of Hades by means of the same desire. By so doing, he made Adam's fall difficult to reverse, and it required God's extraordinary presence, which has now been accomplished, to restore him. His own fall, however, he rendered incurable once and for all, because himself the principle of evil and the fullness of evil, and made himself available to anyone wishing to participate in evil. Now since it was God's good pleasure to annul the pretext for that pride which brought down His rational creatures, He makes everything like Himself; and because by nature He is equal to Himself and equal in honor, He makes the creation equal to itself by grace and equal in honor. And how was this done? The very Logos/Word of God from God emptied Himself in an indescribable way, came down from on high to the lowest state of man's nature, and indissolubly linked it with Himself, and in humbling Himself and becoming poor like us, He raised on high the things below, or rather, He gathered both things into one, mingling humanity with divinity, and by so doing He taught everyone that humility is the road which leads upwards, setting forth today Himself as an example before men and holy Angels alike. Because of this, the Angels now possess steadfastness, having learnt in a practical way from the Master that the way to be exalted and resemble Him is not arrogance but humility. Because of this men are easily set right, as they recognize humility as the road by which they are recalled. Because of this, the prince of evil, who is conceit itself, has been put to shame and overthrown, whereas previously he imagined that he could somehow stand and was something, inasmuch as he had enslaved some, and pulled them down with himself, through their desire for something greater, while also hoping to do the same to others through their extreme folly. Now he is seen as a plaything, having been well and truly found out by those he had evilly deceived before. Now that Christ has been born, the devil is trampled down by those who were previously under his feet, who are no longer presumptuous, as the destroyer advised, but identify with lowly (cf. Romans 12:16), as the Savior taught through His deeds, and win heavenly exaltation through humility. That is why God Who sits upon the Cherubim (Psalm 99:1) is set before us as a babe on earth. He upon whom the six-winged Seraphim cannot look, being unable to gaze intently not only at His Nature but even at the radiance of His glory, and therefore covering their eyes with their wings (Isaiah 6:2), having become flesh, appears to our senses and can be seen by bodily eyes. He Who defines all things and is limited by no one is contained in a small, makeshift manger. He Who holds the universe and grasps it in the hollow of His hand, is wrapped in narrow swaddling bands and fastened into ordinary clothes. He Who possesses the riches of inexhaustible treasures submits Himself voluntarily to such great poverty that He does not even have a place at the inn; and so He enters into a cave at the time of His birth, Who was brought forth by God timelessly and impassibly and without beginning. And--how great a wonder!--not only does He Who shares the Nature of the Father on high put on our fallen nature through His birth, nor is He subject merely to the utter poverty of being born in a wretched cave, but right from the very start, while still in the womb, He accepts the final condemnation of our nature. He Who is by Nature Lord of all is now ranked with the servants and enrolled with them (St. Luke 2:1-6), clearly making humble service to others no less honorable than the exercise of lordship, or rather, showing the servants as having greater honor than the earthly ruler at that time, provided of course they understood and obeyed the magnificence of grace. For the man who then seemed to rule the world was not counted with the King of Heaven, though all his subjects were, nor was this earthly ruler reckoned then as one of them, but the heavenly Lord was. David, who is a forefather of God on account of Him Who has now been born of his line, hymns God somewhere, "Thy hands have made me and fashioned me: give me understanding, that I may learn thy commandments" (Psalm 119:73). What does this mean? That only the Creator can grant true understanding. Anyone who has been vouchsafed understanding and grasped the honor which our nature received from God through being formed by His hands in His own image, will run towards Him, having come to a realization of His love for mankind, and will obey Him and learn His commandments. But how much more so if he comprehends, as far as possible, this great mystery of our re-creation and restoration. God formed human nature out of the earth with His own hand and breathed His own life into man (Genesis 2:7, cf. 1 Thessalonians 5:23), whereas everything else He brought into being by His word alone. He then allowed man to be governed by his own thoughts and follow his own initiative, because he was a rational creature with a sovereign will. Left alone, deceived by the evil one's counsel and unable to withstand his assault, man did not keep to what was in accordance with his nature, but slid towards what was unnatural to it. So now God not only forms human nature anew by His own hand in a mysterious way, but also keeps it near Him. Not only does He assume this nature and raise it up from the fall, but He inexpressibly clothes Himself in it and unites Himself inseparably with it and was born as both God and man: from a woman, in the first instance, that He might take upon Himself the same nature which He formed in our forefathers; and from a woman who was a virgin, in the second, so that He might make man new. If He has been born from seed, He would not have been a new man and, being part of the old stock, and inheriting that fall, He would not have been able to receive the fullness of the incorruptible Godhead in Himself and become inexhaustible source of hallowing. And so, not only would He not have been able to cleanse, with abundance of power, our forefathers' defilement caused by sin, but neither would He have been sufficient to sanctify those who came later. Just as water stored in a tank would not be sufficient to provide a large city with enough to drink continuously, but would require its own spring, so that it is never surrendered to the enemy (Satan) on account of thirst; in the same way, neither a man not Holy Angel who, by sharing in grace, had the ability to make things holy, would suffice to sanctify everyone at all times. But creation needed a well containing its own spring, that those who drew near it and drank their fill might remain undefeated by the attacks of weaknesses and deprivation inherent in the created world. So neither an Angel nor a man, but the Lord Himself came and saved us, being made a man like us for our sake, and continuing unchanged as God. Building now the New Jerusalem, raising up a temple for Himself with living stones (Ephesians 2:20-21, cf. 1 Peter 2:5), and gathering us into a holy and worldwide Church, He sets in its foundation, which is Christ (cf. 1 Corinthians 3:11), the ever-flowing fount of grace. For the Lord's eternal fullness of life, the All-Wise and Omnipotent Divine Nature, is made one with human nature, which was led astray through lack of counsel, enslaved to the evil one out of weakness, and laid in the deepest caverns of Hades for want of Divine Life, that the Lord might instill into it wisdom and power and freedom and unfailing life. And look forthwith at the symbols of this ineffable union and the resulting benefit poured out even upon those far away. A star accompanies the Magi (St. Matthew 2:2-10): coming to a halt when they do, and traveling with them when they move on, or rather, drawing them and inviting them to the road, as their leader escorting them on their journey. It offers itself as their guide when they are on the move, and when they rest awhile it permits them to do so, and itself stays in its place, lest deserting them it should grieve them by its absence, seeing to abandon its role as guide before journey's end. For it caused them considerable distress by concealing itself from them when they approached Jerusalem. Why did it hide from them while they were there? To make them, through their inquiries, unsuspecting heralds of Christ Who was born at that time according to the flesh. Because they presumed they would learn from the Jews where Christ was to be born according to the sacred prophecies, the divine star left them, teaching us that we should no longer seek to find out about the law and the prophets from the Jews, but rather to seek after the teaching that comes from above. When they left Jerusalem, the star appeared again to their delight, and went before them to lead the way, "till it came and stood over where the young Child was" (St. Matthew 2:9), obviously worshiping with them this earthly and heavenly Infant. This star first brings the Magi as a birthday gift to God, born upon earth, and through them to the whole Assyrian nation, according to the saying of Isaiah: "In those days the Assyrians shall be the first nation for God, and after them the Egyptians, and Israel shall be the third" (cfr. Isaiah 19:23-24), as is now seen coming to pass. For the veneration by the Magi was immediately followed by the flight into Egypt (St. Matthew 2:13), during which He delivered the Egyptians from idols (cf. Isaiah 19:1), and after His return from there, a nation worthy of God's possession was chosen from among Israel. And while Prophet Isaiah openly foretold these events, the Magi worshipped Him in person, bringing gold and frankincense and myrrh (St. Matthew 2:11, cf. Isaiah 60:6) to Him Who, through death, symbolized by myrrh, grants us divinely inspired life, of which frankincense is a image, and His divine radiance and Kingdom, represented by the gold offered to the Giver of Eternal Glory. On account of Him Who is born today, shepherds stand in the same choir as Angels, sing the same hymn, and strike up a melody together. The Angels do not take the shepherd's pipes into their hands, but the shepherds, surrounded by the radiance of the Angel's Light, find themselves in the midst of the Heavenly Host and are taught a heavenly song of praise by the Angels, or rather a hymn both heavenly and earthly, saying, "Glory to God in the Highest, and on earth pace" (St. Luke 2:14). Now He Who dwells on High and Reigns over the celestial heights has the earth as His Throne, and is glorified on earth as much as there (cf. Isaiah 66:1, Acts 7:49), by His Saints and His Angels alike. But what is the cause of this praise from men and Angels together and this much-extolled good news which so gladdens the shepherds and all men? "Behold", it says, "I bring you good tidings of great joy, which shall be to all people" (St. Luke 2:10). What does this mean, and what is this universal joy? Listen to the Gospel song to the end and you will understand. "Peace", it says, "good will toward men" (St. Luke 2:14). For God, Who was angry with the human race and subjected it to terrible curses, has come in the flesh, granting His peace and reconciling them to the heavenly Father. Behold, says the hymn, He has not been born for us Angels, though now that we see Him on earth we extol Him as we do in heaven, but for you men, that is to say, for your sake and in accordance with your nature as Savior is born, Christ the Lord, in the city of David. What is meant by linking God's good will with peace? "Peace", it says, "good will toward men". There were times before when He gave signs of peace to men. To Moses "the Lord spake, as a man speaketh unto his friend" (Exodus 33:11); and He found David a man after His own heart (1 Samuel 13:14; Acts 13:22); and He granted tokens of peace to the whole Jewish nation when He came down upon the mountain for their sake and spoke to them through fire and the thick dark cloud (Exodus 19:9, 16-18; Deut. 4:10-11), but not according to His good pleasure. For good will refers to that which is in and of itself well-pleasing, the original and perfect will of God. It was not the original and perfect will of God that He granted benefits, and not even perfect ones, to certain men or to one nation only. That is why, just as God called many people His sons, but there is only one in whom He was well-pleased (cf. St. Matthew 3:17; 17:5), so He gave His peace on many occasions, but only once accompanied by His good pleasure, which He grants, perfect and unchanging, through the Incarnation of our Lord Jesus Christ to every race and to as many as desire it. Brethren, let us preserve this peace in ourselves as far as we can, for we have received it as an inheritance from our Savior who has now been born, who gives us the Spirit of adoption, through which we have become heirs of God, and joint heirs with Christ (cf. Romans 8:15, 17). Let us be at peace with God, and doing those things which are well-pleasing to Him, living chastely, telling the truth, behaving righteously, "continuing in prayer and supplication" (cf. Acts 1:14), "signing and making peace with ourselves, by subjecting our flesh to our spirit, choosing to conduct ourselves according to our conscience, and having the inner world of our thoughts motivated by good order and purity. Thus we shall put an end to the civil conflict in our own midst. Let us be at peace with one another, "forbearing one another, and forgiving one another, if any man have a quarrel against any: even as Christ forgave you" (Col. 3:13), and showing mercy to each other out of mutual love, just as Christ, solely for love of us, had mercy on us and for our sake came down to us. Then, recalled from the sinful fall through His help and grace, and lifted high above this world by virtues, we may have our citizenship in heavenly places (cf. Phil. 3:20), whence also we wait for our hope (cf. Romans 8:23), redemption from corruption and enjoyment of celestial and eternal blessings as children of the Heavenly Father. May we all attain to this, at the future glorious advent and epiphany of our Lord and God and Savior Jesus Christ, to Whom belongs glory unto the ages. Amen. From Homily 58, Saint Gregory Palamas: The Homilies (Mount Thabor Publishing, 2009).